KONIs are not the average shock absorber, they feature a number of standards that make them unique. KONI's entry level performance shock, the STR.T is a perfect replacement shock/upgrade for original equipment shocks. The range of KONI's STR.T Shocks are a newly tailored and engineered to give your car that Koni sports feel. 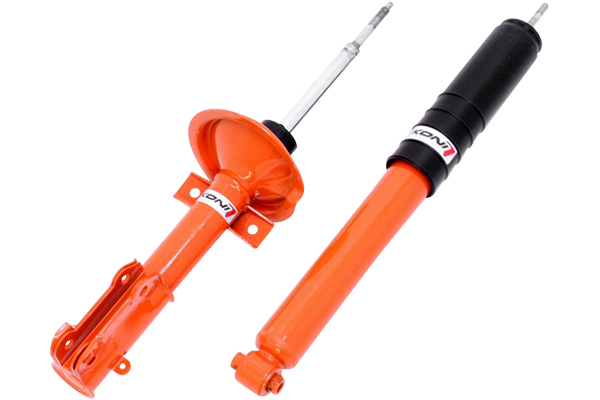 The bright orange dampers are sure to look good on any vehicle. These shocks will offer your car less roll and you will feel an overall better feel of the handling of your 1 or 3 series. KONIs improve the ride and handling of your car. The damping characteristics are developed for each particular application. Our specialists keep on testing and modifying until they are convinced they reached the optimum in both handling and comfort. Do not forget that safety is a major issue. The handling of your car is essential for safe driving. Here the qualities of the KONI shock absorber make a great contribution. Involved drivers have their wishes, and KONI fulfills them in most cases. Why .... ?? The KONI people are involved drivers themselves, so they know. Last but not least, KONl''s are built to last a lifetime. Once you have bought a set of KONl''s for your car, they usually will outlive it. KONI street shocks carry a lifetime warranty to the original purchaser for as long as you own the vehicle. *Customer Feedback on fitment: E90 325i, E90 328i, E90 330i, E90 335i, E92 328i, E92 335i excluding xi models. Please call us at 714-582-3330 for more details on the Koni STR.T Shocks for your BMW!